We recently went on a short camping vacation (5 days, 4 nights). Since we didn’t make reservations in advance, and it was perhaps the busiest camping time of the year (the first week in August), our options were somewhat limited. However, this was our first experience with camping in Northern California, so it was to be a learning experience. 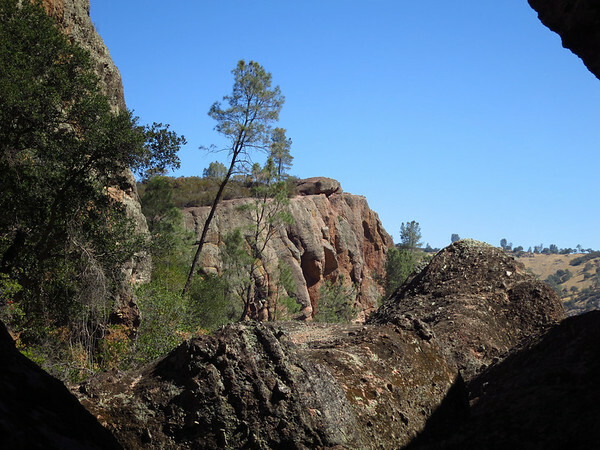 In the end, we camped at three places: Pinnacles National Park ($23/night plus $5/week National Park fee), Cerro Alto Campground in the Los Padres National Forest ($18/night), and Big Basin Redwoods State Park ($35/night plus $8 reservation fee). 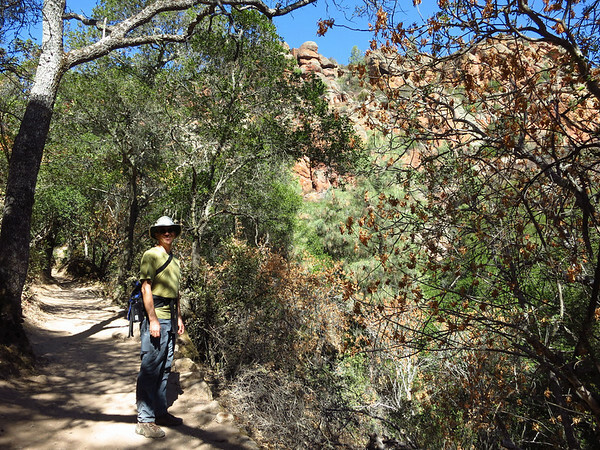 In this post, I’ll talk about our experience at Pinnacles National Park. We arrived at about 2pm on Saturday August 3rd and stayed for one night. 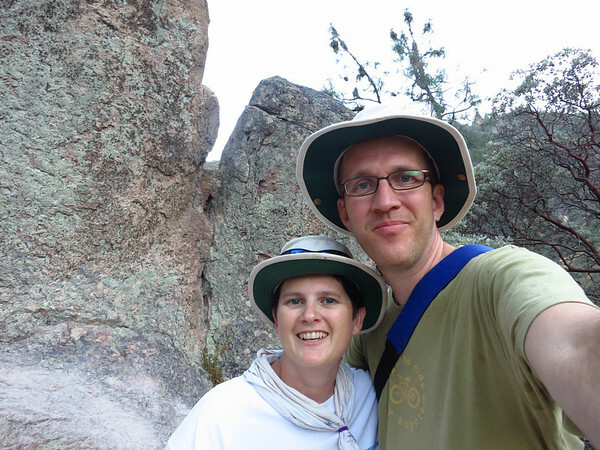 We ended up at Pinnacles after we realized that we had booked an invalid site at Fremont Peak State Park. For Saturday night there were three sites open at Fremont Peak State Park. I chose one that looked good and booked it. I didn’t think much about the accessible sign on the site map. In Ontario, the provincial parks will often label several sites as “accessible”, however, there is no limit on who can reserve them. So, I had not realized that in California, we would be allowed to reserve an accessible site, but upon arriving, if you don’t have a disabled permit, you are not allowed to use the site. All the available sites were accessible, so I had to look further for another place to camp. 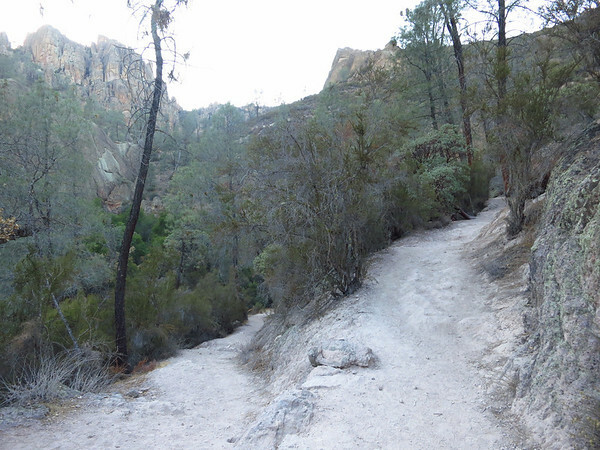 Fortunately, Pinnacles National Park had a few vacant spots. When we decided to go to Pinnacles, one of Scott’s coworkers forwarded us a link to this great documentary on the park (Motion Episodes: Pinnacles). 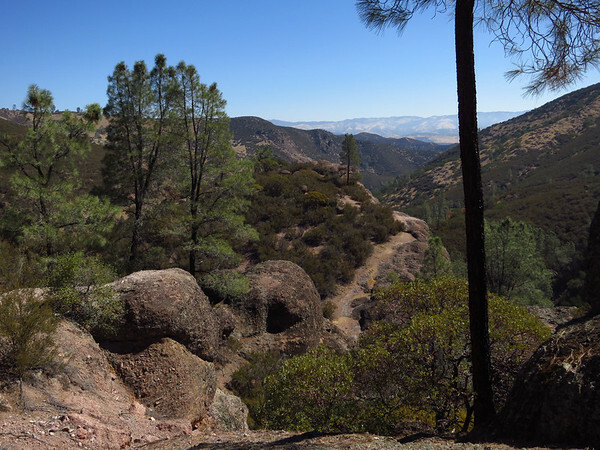 Prior to becoming a National Park just this year (2013), it was established in 1908 as Pinnacles National Monument. 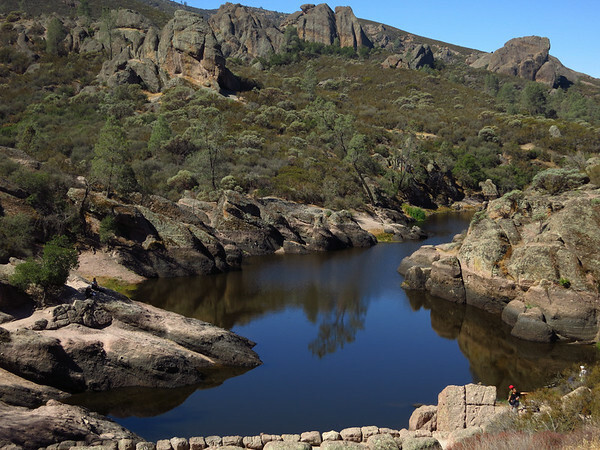 As the documentary indicates, Pinnacles has some great hiking trails. Fortunately, the documentary also highlighted that camping is located at the EAST entrance, and highway 146 which is the park access highway from both the EAST and WEST is not connected! The East and West entrances are about a 90 minute drive apart. 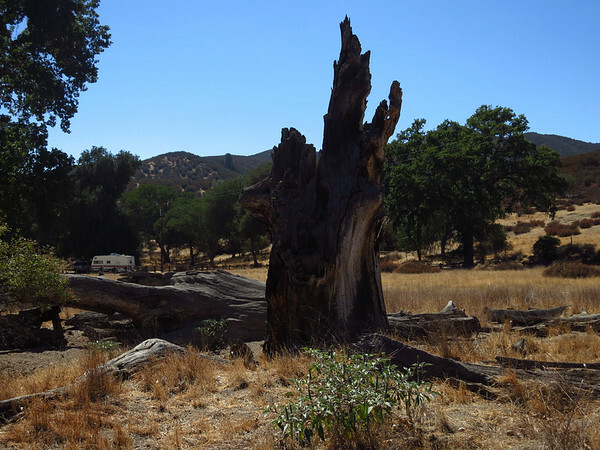 Pinnacles campground was nothing special, but I would still recommend it for families. The swimming pool was a huge hit for the many kids at the campground. Fortunately, our site had partial shade, as it can get rather hot (35+C, 100F) during the day at this time of year. This National Park has a lot of great and very interesting hiking trails, including some that take you through caves and along the mountain ridge lines. Apparently, it is at its best during the spring with all the wild flowers, or the fall with the changing colours of the leaves. Being from Canada (and Ottawa in particular), the fall colours in California are likely to disappoint, so we shall plan to return sometime in the spring. Even though it gets rather hot during the day, it still gets cold at night. The hot days meant that it was too dry for camp fires, which usually would not bother us. However, the cool evening temperatures and no camp fire meant that we found ourselves bundled up in our tent by 8:30 p.m.
Notice how dry the land is. The trees provide a nice contrasting green to the brown of the grasses. Scott and Becky out for an evening hike, after it started to cool down a bit. The trail involved several switchbacks as you climbed up toward the ridge. We were struct by just how dry everything was. The next morning we choose a different trail – this one through a cave and up to a reservoir. The blue sky made for much better pictures. Peeking out from inside the cave. Looking out into the valley. Leaving Pinnacles National Park, we drove past many brown hills dotted with green trees and the occasional cow. 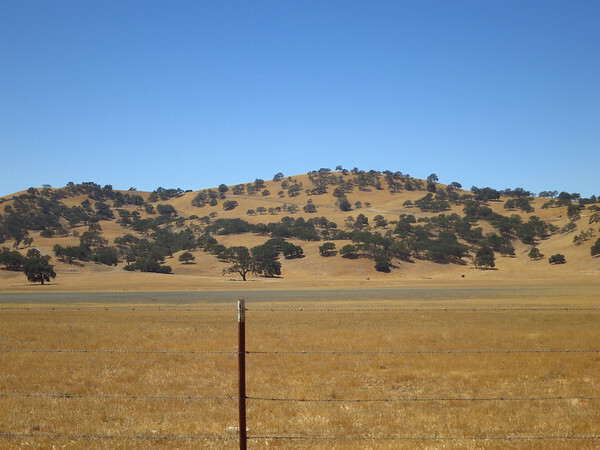 This type of landscape is common to the valley South and East of San Jose.